A couple of weeks late and a few dollars short, but here’s the entry from the June 14 challenge: Curves. Inspired by last night’s side salad. Weekly Photo Challenge. Curves. | Maybrick’s Canon Shots. Hmm. Had to dig deep into the checklist of companions. Don’t have any photos of God. 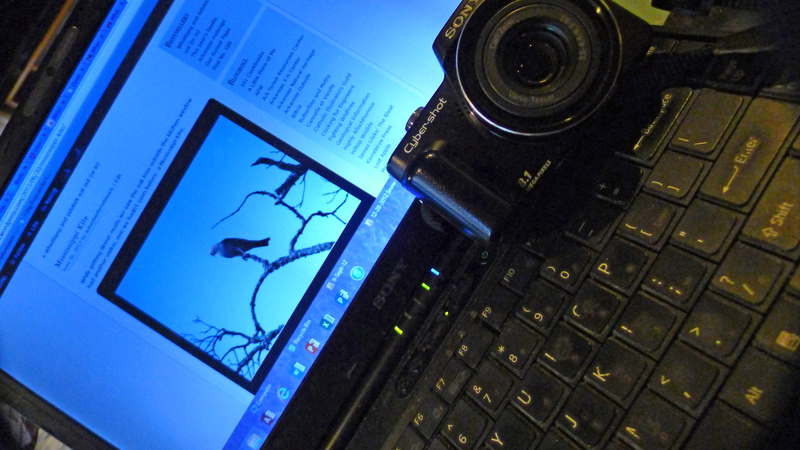 Then there’s my photographer husband who doesn’t like to be in front of the camera, and with no pets, that left me with these two: Gamera, the well-traveled and oft-shot Sony camera, and Fideaux, the aging Vaio laptop held together with gaffer tape. The keyboard has pounded out hundreds, if not thousands of news and feature stories, graduate class papers and has edited thousands of photos. Oh, and it’s the main posting machine for this blog. The Sony has blasted out more than 10,000 photos and I’ve stopped counting. I’m almost never without at least one of them. While getting dinner ready,we saw the oak tree outside the kitchen window had another visitor, one we hadn’t seen before: a Mississippi Kite. 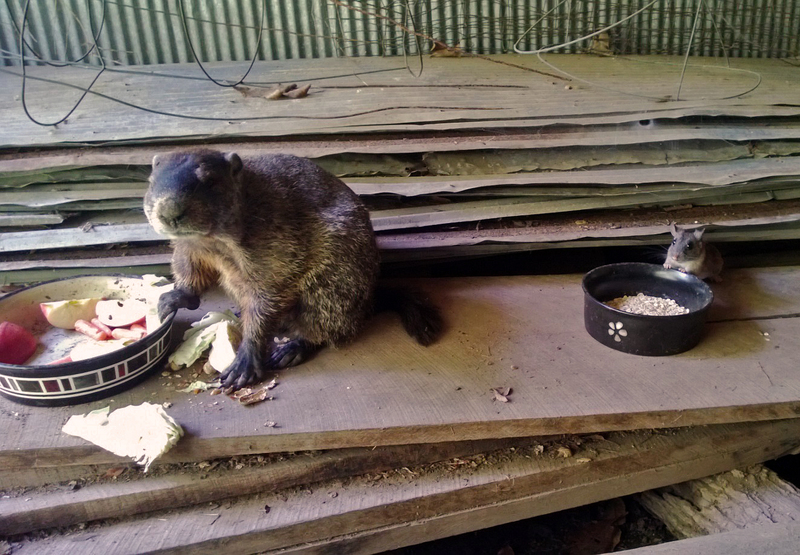 Readers are familiar with that blogally famous Perry County Prognosticator, Blossom the Groundhog. As good as her predictions are, she has been a little less predictable. However, her spokespeople, Tamara and Jack, have sent new dispatch. Blossom has reappeared after spending the spring rearing a den of babies (pups? kittens? whistlepiglets?) 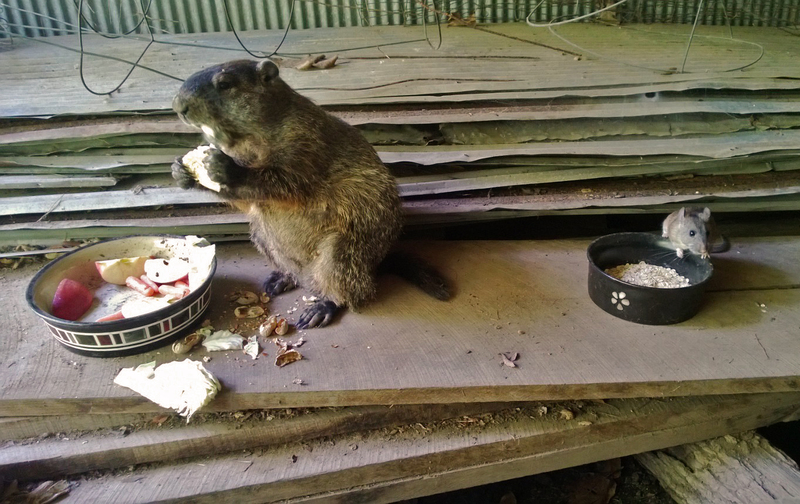 Jack, an excellent human chef and vintner, was pleased to offer a spread that would delight any rodent of Blossom’s stature: cabbage, apples and peanuts. 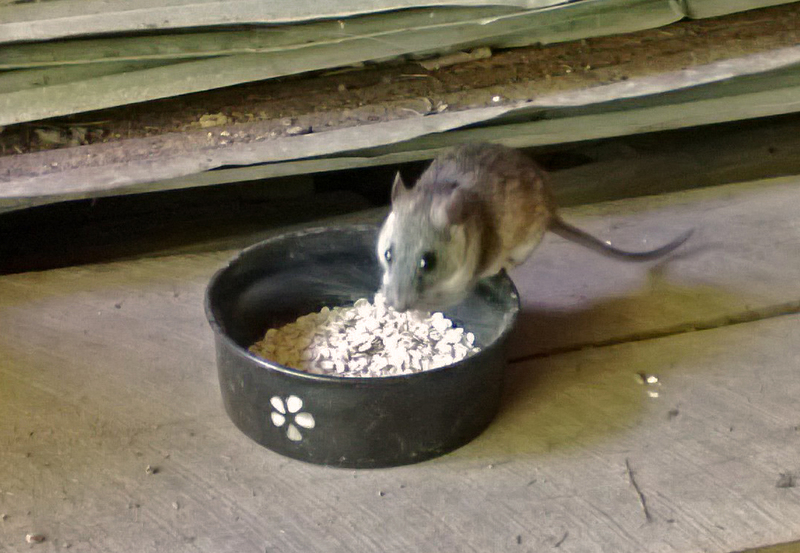 This time, Blossom brought a friend, the curl-your-toes-cute Ratty the wood rat, who was content with a bowl of oatmeal. Thanks to Tamara and Jack for the photo update! A few months back, a walk in the woods and a little walk through history, inspired a post titled “Mythic Figures.” Going through the files, found an image I forgot to include in that post. 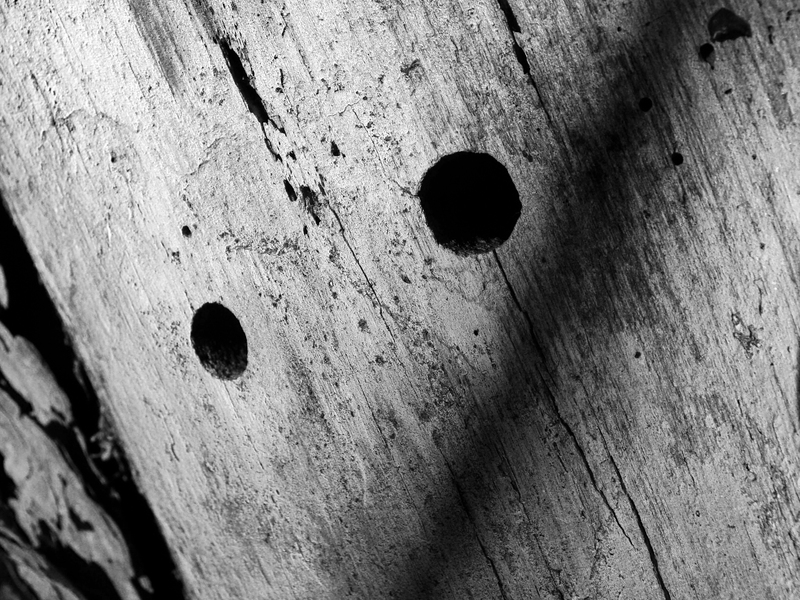 A pair of woodpecker borings reminded me of Athena’s owl. 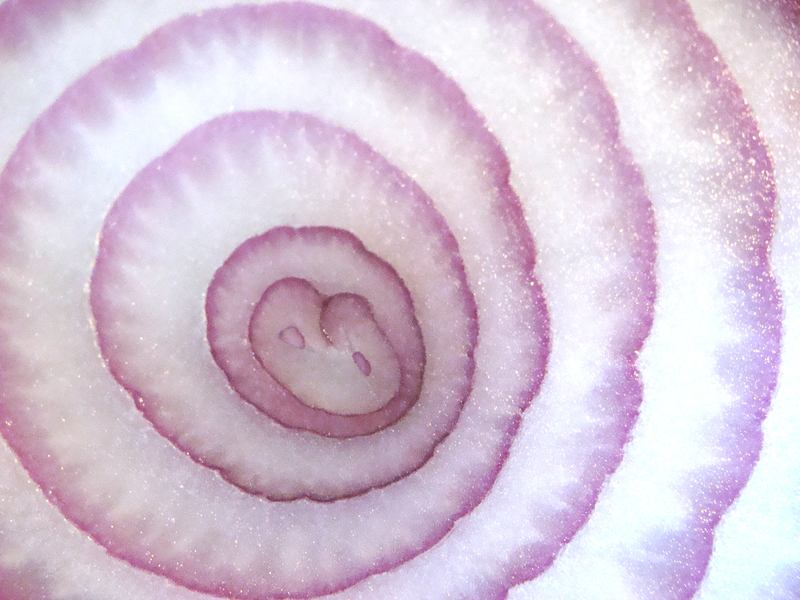 Like eyes peering through man’s folly. “Orphan” photos without a theme, except they were all taken in Arkansas. How do you like my cockatoo impersonation? One of our resident hares browsing in the backyard. Looking up at mimosa canopy. Afternoon sun over the I-430 bridge over the Arkansas River with Pinnacle Mountain in the background. We welcome any input on the IDs of some of these flowers! Coreoposis thriving in a parking lot. Yellow crown beard in the under story. 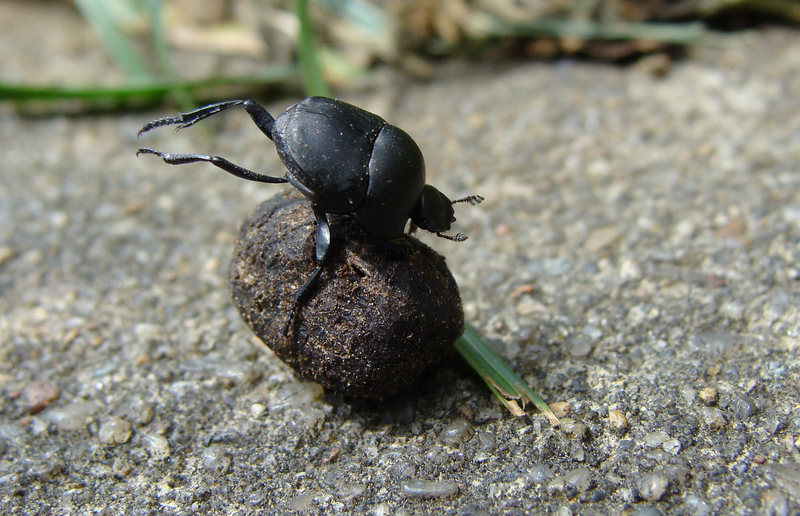 An acrobatic dung beetle at the end of the driveway. Nature shows there is beauty in both life and death. Harvestman falls into orb spider web. The white lace of the web wrapped around the harvestman’s legs reminded me of whirling dancer. Wild onion blooms in the woods. Fallen mimosa blossom. Tired maybe, but no less beautiful. A parabolic mirror that rests on one of our sills can cast a very bright spotlight through the window at night when the room light is on. The spot is a magnet for nocturnal insects. This very fuzzly moth parked himself right in the middle earlier this week. 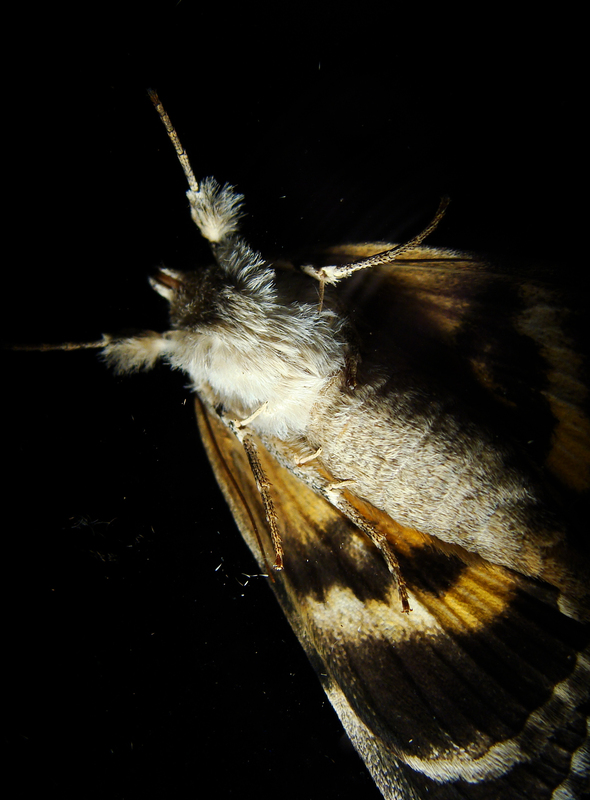 THAT’S ME IN THE SPOTLIGHT — Moth makes a nighttime stop on a lighted window.